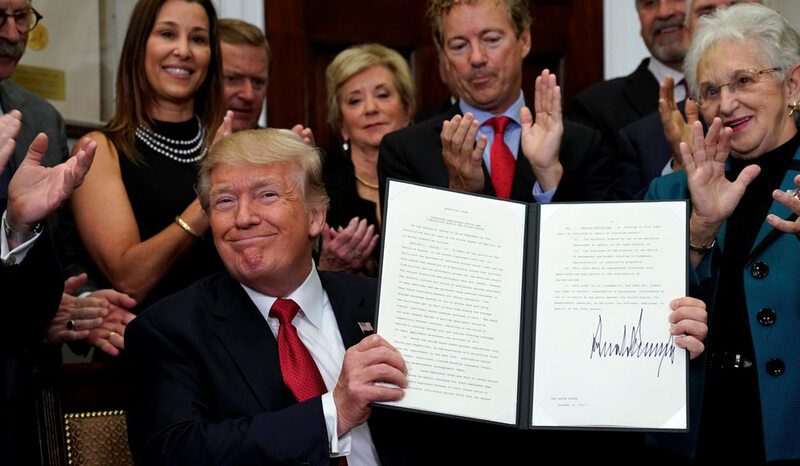 President Donald Trump on Thursday signed an order to make it easier for Americans to buy bare-bones health insurance plans, using his presidential powers to undermine Obamacare after fellow Republicans in Congress failed to repeal the 2010 law. Trump issued the executive order aimed at letting small businesses band together across state lines to buy cheaper, less regulated health plans for their employees with fewer benefits. Such new insurance options, however, may not be available until 2019, and the order could face legal challenges from Democratic state attorneys general. It was Trump’s most concrete step to undo Obamacare since he took office in January promising to dismantle Democratic former President Barack Obama’s signature domestic policy achievement. Later on Thursday, Politico reported that Trump plans to cut off subsidy payments to insurers selling Obamacare coverage, citing two people familiar with the matter. Trump has repeatedly threatened to stop the payments, which are made directly to insurance companies to help cover out-of-pocket medical expenses for low-income Americans enrolled in individual healthcare plans under Obamacare. The payments are estimated at $7 billion in 2017. If Trump does eliminate the subsidy payments, premiums for many customers on the Obamacare individual insurance markets would be 20 per cent higher in 2018, the nonpartisan Congressional Budget Office has said. Republicans call Obamacare, which extended health insurance to 20 million people, a government intrusion into Americans’ healthcare, and have been promising for seven years to scrap it. Trump’s order aims to give people more access to cheaper plans, which do not cover essential health benefits such as maternity and newborn care, prescription drugs, and mental health and addiction treatment. Obamacare, known formally as the Affordable Care Act, requires most small business and individual health plans to cover those benefits. “The cost of the Obamacare has been so outrageous, it is absolutely destroying everything in its wake,” Trump said at a White House signing ceremony. Trump’s order was aimed at making it easier for small businesses to join together as associations across state lines. Unlike large employers that can create their own health plans because their work forces are big enough to spread risk―mitigating the effect of individuals with serious illnesses―small employers have few options to offer reasonably priced health coverage. Allowing small employers to band together in associations is meant to give them options similar to larger companies. The White House also said the associations would give employers more leverage to negotiate with insurance companies in purchasing health insurance plans for employees. Some of the business groups that the order is aimed at, including franchise organisations and retailers―which generally have a large number of hourly employees―said they are interested and want to be part of the rule-making process at the Department of Labor, but cautioned that there are many details to tackle. “It’s not something we’ll be able to open a suitcase tomorrow and be in business with. There are a lot of issues to be worked out and to consider,” said Neil Trautwein, vice president of health care policy at the National Retail Federation. A spokesman for the National Federation of Independent Business, the largest small-business association in the country, said it would be watching to see “how the regulatory architecture develops” and make a determination in the future. Small businesses have been among the biggest critics of Obamacare. The order also sought to change an Obama-era limit on the time span that people can use short-term health insurance plans, which are cheaper but cover few medical benefits. Those plans are currently limited to three months. Joseph Antos, a healthcare expert at the conservative American Enterprise Institute think tank, said he did not believe the order would have much of an impact because employers from regions with lower healthcare costs, like Iowa, would not want to join up with those from regions with higher costs. Experts also questioned whether Trump has the legal authority to expand association health plans. Democratic state attorneys general have said they will sue if Trump tries to destroy Obamacare. California Attorney General Xavier Becerra said Trump’s executive order is just another step toward imploding the Affordable Care Act. “It should come as no surprise that California is prepared to fight in court to protect affordable healthcare for its people,” Becerra said. The association health plans could attract young, healthy people and leave a sicker, more expensive patient pool in the individual insurance markets created under Obamacare, driving up premiums. Small health insurers and state insurance regulators also criticised Trump’s move. Hospital stocks edged lower in Thursday trading, with HCA Healthcare Inc down 1.7 per cent and Tenet Healthcare Corp down 4.4 per cent. Medicaid insurers also fell with Centene Corp off 2.5 per cent. Trump has taken a number of other steps to weaken or undermine Obamacare. He has not committed to making billions of dollars of payments to insurers guaranteed under Obamacare, prompting many to exit the individual market or hike premiums for 2018. The administration also halved the open enrollment period, which begins November 1, slashed the Obamacare advertising and outreach budget, and allowed broad religious and moral exemptions to the law’s mandate that employers provide coverage for women’s birth control.